I'M sure there'll be all sorts of film critic puns for this befittingly-titled Matt Damon family drama, so I'll sidestep that (for now) and get right into it. You're probably not going to like this movie if: a) you despise movies with non-talking animals, b) you want to be caught off guard by a dramatic plot twist, or c) you like Matt Damon movies. But, if you don't really care about any of that stuff, then you just might like a trip to Damon's Zoo. film is also real, the Rosemoor Wildlife Park in California. A zoo, just in case you were still unclear. 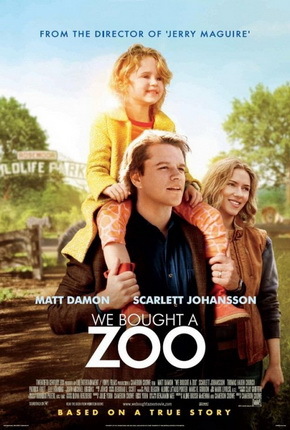 While dealing with the loss of the love of his life, a defiant son who doodles corrupt images of detailed decapitations, a cynical brother (Thomas Haden Church), and a strained bank account, Benjamin struggles to rehabilitate this California enclosure for lions, tigers, and bears. And 44 other species. Oh, and he's falling for the too-pretty-to-be-a-zookeeper zookeeper (Scarlett Johansson). Let's just say (SPOILER ALERT) that it all comes together in the end. No real surprises here. Actually, the backbone of this sometimes gummy plot is quite similar to that of his Syriana and Ocean's trilogy cohort George Clooney's The Descendants (which I thought was better...just sayin'). Minus the zoo, of course. And with a few more four-legged co-stars...and that's not another reference to the movie Stuck On You! But it made me laugh at times, and maybe...perhaps...could of...made me tear up a bit? Okay, okay! But just a little bit, I swear! Plus, some of that jonsi-heavy soundtrack was pretty sweet. Sure, it ran a bit too long (2 hours), it could've done without a mis-cast John Michael Higgins as the cartoonish zoo inspector, and there were a few eye roll moments, but it held up until its stretched-out conclusion. Good for the kiddies, too, but make sure they shut up during the movie. Just kidding...kinda. Click here for Edmonton showtimes.